Spring has officially arrived in the Northern Hemisphere, a fact that causes ruggers and non-ruggers alike to celebrate the end of a long, cold winter. At least in most places it does – Pelicanland has barely noticed. Our drought parched landscape has been subject to springesque weather for most of the winter broken up by occasional, fleeting rainstorms. It may seem churlish to our brethren in the rest of the country busy digging out from under another massive snowstorm that we complain of sunny, warm weather all the time but, in spite of the debunking of the fantastical “California Has One Year Of Water Left” scare, we are a thirsty people indeed. Hail Pelicus has always been a bold publication and has tested the limits of the possible, probable and particularly silly and we aren’t backing down from this, our latest outrageous stance: We could use a little more winter around here. Apparently not enough of you loyal readers had sacrificed a chicken to the Weather Priestess when I asked you to. You only have yourself to blame. So it was with another postcard day that I arrived to referee the San Jose Seahawks hosting the EPA Bulldogs (see thrilling account below) when I ran into Pelicus Scriptoris, Dux Deux aka Dr Bruce Carter who had just finished adjudicating a high school match on the next field over. Up walked Josh Pendegrass who is currently recovering from injury but had a rugby itch that needed scratching. After chatting with them a bit I went over to the Bulldogs and Seahawks to set the timing of the day and say hello to see that EPA had added a new coach to their staff, a rather familiar face. Guess what? I had played with every single coach on both coaching staffs. This got me to thinking about the current juxtaposition of two trends I see in rugby today. The first is an old one: the rugby community is a close knit group and as you progress through your career you will see friends again and again. As you age out of your (always illustrious) career and move into refereeing, coaching or just plain fandom you tend to see old friends and teammates giving back just as you are. Friends from my playing days are coaching their kids and the kids of other teammates and, occasionally, bitter opponents. Once rugby gets its hook into you it is a rare human who can resist the pull, and why would you? It is the Game That Is Played In Heaven, after all. The second is a new one: the explosion of rugby across the age groups in Pelicanland as well as the rest of the country. This is the second time I have been at a Seahawks home match – the first being the result of a rare rainout – and on both occasions there was youth rugby, high school rugby, women’s rugby and men’s rugby all going on at the same time. There was more rugby than you could shake a stick at, not that you would want to. I really don’t know what shaking sticks at things is supposed to accomplish anyway. The point is that in the days of my youth high school rugby was a rare thing, youth rugby was non-existent and women’s clubs were limited to a few hardy bastions. An event like last Saturday just didn’t happen. Now it is a regular part of the schedule. So what does this mean? We are now living in the sweet spot, that time where rugby is still “underground” enough to be a community where everyone knows each other to within a few degrees of Kevin Bacon, yet the upswell of popularity in the game is creating the first generation of players who will have played since their single digits and will have more teammates than not who are in the same boat. It has been noted by many that at the national team level it is now a rarity for a player not to have started in high school and learned the game as a teenager. The old team building rubric of finding some ex-football/soccer/wrestling stars who picked up the game in college is obsolete – we no longer need to turn athletes into rugby players because they are already there. We are now poised to go a step further and join the rest of the fully developed rugby nations in exposing our players to the game when they are hardly bigger than the ball, running and passing and giggling as little tykes and picking up skills, allowing for players to enter high school with 6 or more years under their belts and reaching the national team with just as much rugby experience as that Kiwi starting across from them. This makes a huge difference. In the 90s we had Dan Lyle, a superior athlete who played football in college, then picked up rugby to stay fit and within few years was one of the best players in the world. Today we have Todd Clever who started playing in high school with his brother and went on to become a world class flanker and the first American to play Super Rugby. Tomorrow… well, who knows? I expect to see someone whose parents started him in minis at age 5 and arrived on the national scene at age 19 not only with a man’s body, but with a rugger’s brain. There will always be room for the freak athletes, the exceptional ones who can be all world at anything they try with just a bit of effort, but the days of relying on that paradigm are gone. There were too many misses for the hits. I guess Spring is a time of renewal and hope, after all. Thank you Kevin Barry – the Reputation is intact. There is an opportunity for more stepping up, however. If there is anyone who can meet our visitor this Friday (March 27) at SFO and keep him company until Kevin returns from his own trip late Friday and takes over hosting duties please contact Bjorn Stumer at bstumer@att.net. That’s an excellent question, Mr Procrastinator, as I know that there are some reports that get missed. While there is some editing, just about everything that is submitted is published. The HP is usually put together on Wednesday afternoon so if you want to see your prose on the World Wide Web it is a good rule of thumb to have your report in by Tuesday night. A, lovely day at the polo grounds for a bridge battle between Baracus and Berkeley. The match was close. With a half time score of Baracus 14 – 0 Berkeley. Beverly was able to quickly respond, opening up the second half scoring. But in the end Baracus was too much for Berkeley. It was a joy to oversee a battle of two brutes. Another weekend, another looooong road trip. Redding, Humboldt and now Fresno — certainly getting a good tour of the state. Arrived at the dust-bowl pitch in Fresno with the temperature around 80, felt like 7s season. The Lions looked at the pitch and felt right at home. This was a day for the backs, with sideline-to-sideline play. That said, both back lines pressed well and the game kept close and intense throughout. With two teams both up for it, it became testy at times, with a couple of yellows for dangerous play — silly stuff, rather than malicious. But fundamentally both teams wanted to play, not to muck around, and we made it the full 80 without any flare-ups, something I took personal satisfaction from. As for the game, the Lions gradually racked up tries throughout, and although Fresno pushed and kept it close, the visitors were just a half step better and came away with the points. As advertised: hard hitting, back & forth, competitive 3rd Division conference title match. Marin got off to a good start with 2 converted tries leading 14-10 at half but Reno stormed back to open the 2nd half scoring 2 more also non-converted tries ahead 20-14. With minutes to go Marin intercepted a Reno lineout on its own 10 meter line & went in untouched. A conversation or a penalty kick they got with seconds remaining for about 40 meters out would have won the match for them had either been good instead losing 19-20. Tough match to lose. With some luck they may sneak into the 4 team playoff format for the 3rd Division & might win it the way they played in both their forwards & backs Saturday. Another good party hosted by Marin at the Flatiron in San Rafael which looked different with other guests there. Oh yeah, thanks for Lee Johnson providing invaluable insights & giving me a thumbs up for not missing a forward pass which apparently I did in the 1st half. 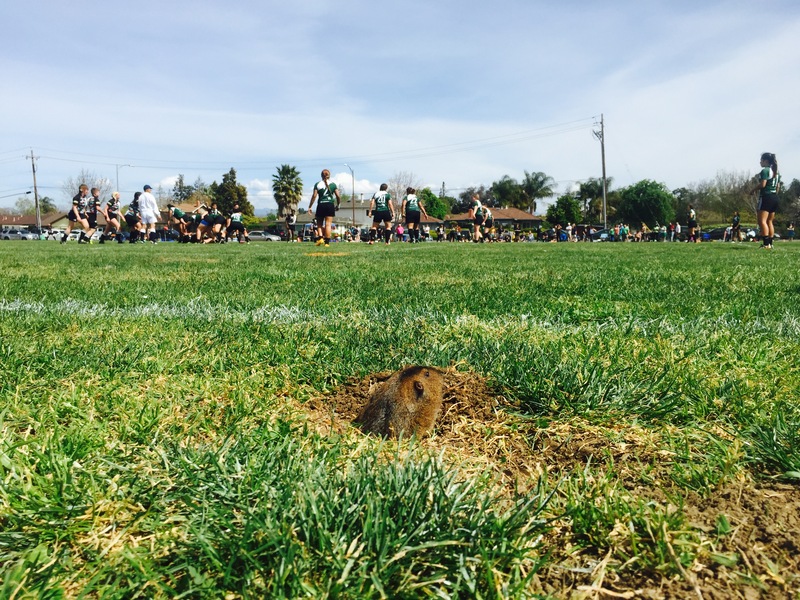 San Francisco Golden Gate hosted a rugby hootenanny on Saturday. A series of high school games being played on their two fields, along with mens PRP, D1 and Alumni. Just a beautiful day for rugby. Temperatures 70s, good field, good crowd and lots of food and beverages. Truly one of the gem venues in the USA for rugby. In my game the O-club was too young for the combo SFGG/Bald Eagle team. There was real rugby played in four 20 minute periods. The first period ended in a 7-7 tie. O-club started to get their form in the second with three try s. SFGG won the third 7-5. O-Club finished strong with a 12-0 final period. All good with captains Mike, Rich and Shawn controlling their “boys”. A fun run for all. SF/GG D1A overcame a battling O Club B side in a good match, generally marked by good, hard, and competitive rugby played in good spirits, but the match was marred by some silly moments. Thanks to both team for the great rugby joy today. Life West keep up the good work. Have fun at the rest of the seasons. Saturday’s a rugby day and San Jose hosted a full afternoon of oval ball action at Blackford in San Jose. The pitch looked great as I walked up, even allowing for the uninformed kids playing a rather silly game with sticks and nets. My hope is that some of them stayed to watch what a real sport looks like and will afterwards consider LAX to be no more than an airport in Southern California. The grass looked freshly mowed and even all around – and that was the problem. Unfortunately the local gopher population has taken a keen interest in this patch of open land and the field was pitted with holes and divots hidden by the deceivingly flat grasstops. Upon even closer examination of the field with Larry Freitas who adjudicated the Women’s match that started off this rugbypalooza we found an absolute mess of lines as first soccer, then rugby had painted white lines on the field – not too bad that as they are easily distinguishable, but then lacrosse had decided that THEY needed more white lines on the field and somehow managed to paint them at a 10 degree angle from everyone else. Oh well, you play on the field you have. One of my first instructions to the captains was to play the whistle as I would most likely at times need to look around for flags and cones to see where exactly we were on the field before making a decision. I am assuming that I did such a wonderful job on the first encounter between the EPA Bulldogs and San Jose Seahawks that both teams begged Pelicus Fistus to assign me to the return leg so here I was with the same teams and same captains as in January, with the Bulldogs hoping for the same result. The game kicked off and away we went. San Jose played structured rugby and EPA tried disrupting everything they could, especially in the scrums where they were dominant. A series of EPA penalties gave San Jose some territorial advantages but they could not unlock the defense. The first score finally came after EPA pressure forced a lineout near the Seahawk goal line. The lineout throw wasn’t straight so San Jose chose to throw themselves, a choice that would haunt them as sloppy ball bounced into the try zone only for an alert Bulldog to pounce on it for a try. The conversion was wide and we went back to half for a kickoff. More EPA penalties resulted in a missed kick at goal by the Seahawks and eventually a yellow card. With the man advantage San Jose put EPA under enormous pressure but the Bulldogs turned the ball over in the tackle and spun it to the backs who found space and scored on a 70 meter break. And then something happened that I have not seen since I was a player and, in fact, did it myself. The conversion was blocked. Not a slight brush with the fingertips gently changing the ball’s flights but a full on rejection back to where it came from. The EPA kicker had a rather deliberate run up to the ball and just took too long to kick. A very alert play from the San Jose 13. After this try against the run of play San Jose kept the pressure up earning another penalty that was duly converted. San Jose’s scrumhalf was adept at getting the ball out of a backwards moving scrum and was very effective sniping around the sides of breakdowns. EPA was able to make a long goal line stand that eventually ended in another penalty kick that went wide. The half ended 10-3 to the visitors. The second half was a completely different story as EPA made the adjustments necessary to combat San Jose’s patterned approach. Three rapid fire tries started the half and EPA was rolling. The addition of ex 7s and 15s Eagle (and former Seahawk suiting up against his old team, no less… yea he played there before going to San Mateo) player/coach Alatini Saulala didn’t help matters for the home side as what he has lost in speed he has more than made up for in guile and Rugby IQ. EPA’s discipline increased as far fewer penalties were called against them but that may also have to do with them spending all their time scoring. A 4th try was added before San Jose added one of their own (converted) and in the move the Bulldogs lost another player to the sin bin. San Jose took advantage to score another try (unconverted) but once parity was reestablished EPA were able to dot down 2 more times to finish off any hope of a comeback. With most of the EPA A side doing double duty the skill level was in favor of the visitors while San Jose had the fresh legs and the thirst for vengeance. This worked out very well for the first few minutes as San Jose got on the board first with a well worked, unconverted try. After that the Bulldogs realized they were in a game and started playing like they meant it. Using their size advantage they were able to free up some space and get a try across and then convert it. With both sides playing the last 9 minutes of the shortened half with 14 men due to some naughtiness the game settled into a back and forth affair. The second half started with the Bulldogs scoring directly off the kickoff – so fast in fact that the sin bins were still serving the final minute of their sentences and were not allowed back on for the restart. Once the game was restored to 15 a side the Bulldogs started rolling. EPA was able to put 4 tries on the home side in the second half to run away with a score of 29-5. San Jose played hard throughout and showed commitment to the tackles but were not able to match the speed of the EPA first teamers. Another warm day in this rugby season that had many of them. Is this the “new normal?” I’d say that Sierra Nevada ski resorts wouldn’t like an affirmative answer on that. Wearing all white kit at least reflects back the sun. The San Jose Seahawks are back playing home games at the old Blackford High School site in the border region of West San Jose and Campbell, as they did some time ago back in the 90’s. 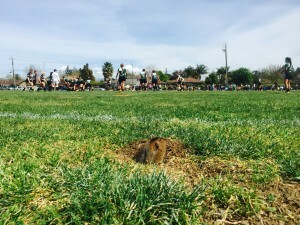 The pitch was laden with gopher holes. A youth lacrosse match was being played when I arrived, meaning the kick off for the women’s match of the day was pushed back to 12:30. It would have been better had it been a soccer match, because lacrosse lines shouldn’t be allowed on a rugby pitch. The Seahawk field committee got to work right after the match (and even before, as they did have one set of the north gold posts already up, and the goal line chalked) lining the field. It really didn’t affect things after all, except that a few times the kicker for a re-start had to check just which line to kick off from, and so did I, which are why there are flags at the half-way line. San Francisco Golden Gate had the advantage from the start, as they were playing a full XV to the Seahawk women’s XIV. Six GG first half tries, two converted, to one for the home side was the result, and a 34-5 lead by the half. After the second half started, two more San Jose women went off due to injury, though one returned after getting a bleeding wound attended. So playing 13 and 12 against 15 meant that the floodgates were opened and Golden Gate scored 11 more second half tries, four of which were converted. There seemed to be some familiar faces on the pitch, as Golden Gate has some Old Banana Slugs on their roster who played on some very good sides at UCSC a decade or so ago, and I was a referee for some of their matches back then. I’d have to say that the Woman of the Match had to be the scrum half for Golden Gate, team captain Tee Stroughter. She scored a hat trick of tries and was in the thick of things during the game. A number of Golden Gate players scored various tries. I was impressed overall by the ball handling ability of either team, and the overall deportment of players. There were some offside and hands in rucks, but the game was cleanly played and San Jose played as well as they could under the circumstances of having few players on the pitch. No one fell into a gopher hole, but my right ankle was a bit sore after the game, as I stepped into a few and half turned my foot, but not enough to get seriously injured. As an aside, a few of Golden Gate’s players, having scored their first tries ever for the squad, had to go through a ritual after the match where a table was set up for food and drink, a fair distance from the touch line, during the men’s match against EPA. I remember that ritual being introduced to California thirty years ago next month (April 1985), when Beantown, a women’s club from Boston, toured in these whereabouts, having their first match against UCSC women. The Santa Cruz Rebels hosted a party for them in downtown Santa Cruz at the Del Mar (now part of the Palomar Restaurant) after the mid-week match. We Rebels were astonished when a huge size 16 high-top rugby boot appeared (and obviously none of the women wore a shoe that size) and was filled with a liquid beverage, only to be consumed at pace by team member who had scored her first try, while her team-mates cheered her. Alena Port, Seahawk player and CSUMB coach, got to hear that story from me yesterday. Not a bad little game. Perfect weather as always in Santa Rosa and the field was in great shape. A couple of lead changes but EPA had much of the control of the game until around the final 20 minutes when Rosa were consistent in their attack of the EPA half. A converted try each in the second half but the Razorbacks did all the necessary damage in the first half. EPA are playing well, but they will have to step up their accuracy at the scrum, lineout and also with their penalty discipline, if they hope to make a deep run into the playoffs. One-way traffic. 29-3 at half. AR’s John Coppinger and John Pohlman were thrilled to work on their speed endurance. Both teams enjoyed the game with friendly bantering back and forth over the pitch. Colusa struck first by managing the ball through strong support players on all breaks, well conditioned. Shasta just couldn’t find a rhythm but was scrappy to the end. Sierra kept up a fast pace of quick picks and hard running to bury Solano. Solano made 3 or 4 strong attacks deep into Solano’s territory only to have Sierra steal possession and run it back the length of the field for a score. Sierra was down a man or most of the second half due to repeat infringements but Solano couldn’t capitalize. Google came out the stronger side, and collected several penalties as a reward. Unlike most clubs I have seen this season, any penalties inside the Silicon Valley half Google went for posts. While they collected some early points with kicks close to the posts, several opportunities went begging as they took several kicks from near mid-field. While Google took a 13-5 lead at the half, they came to regret the lost chances for territory as Silicon Valley was able to get 2 tries across including the final score in the second stanza as they stole victory 19-16. Fine day for rugby at St. Mary’s. CSUMB didn’t travel with enough players for 15’s or 10’s so we played three consecutive 7’s games (cumulative score given). This was the first time most of the players had ever played 7’s but they were well coached and caught-on quickly. CSUMB tired fast and were outplayed by many more numbers on the St. Mary’s side. To CSUMB credit they fought-on to the final whistle despite a large score differential. All sorts of fans were on hand to see San Jose Seahawk Women take on SFGG Women, ably handled by Larry Freitas, all in white. This entry was posted in News on March 25, 2015 by James Hinkin.